The new world-class Pentagon Athletic Center (PAC) replaces the outdated 55-year-old athletic facility with a larger, modern facility. The building includes enhanced programming spaces necessary to meet the fitness and readiness needs of its current military and civilian membership, as well as projected membership growth for upcoming years. PAC, designed by HNTB and Counsilman-Hunsaker, incorporated sustainable concepts in design and construction. The design not only helps to create a functional, durable, maintainable, flexible, and safe facility, it also contributes to a healthy indoor environment and enhanced productivity. 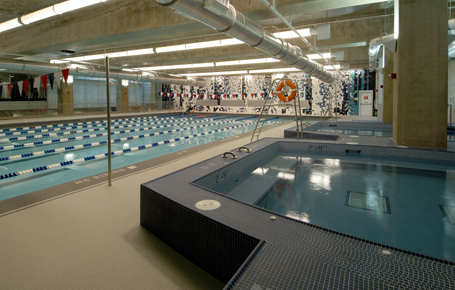 This is an excellent pool for lap swimming, recreational swimming, exercise classes, and other activities.